Embarking on and embracing this next chapter of my life where I start the great adventure of becoming a grandmother. ~I found a code online to give me extra minutes when I refilled the minutes on my phone card. ~Jeff picked up some sale priced mayonnaise for us and found 2 $1 off coupons making them .99 each. We go through a lot of mayo during the Spring and Summer. ~I am bringing a pasta salad for Easter Dinner so I stopped at the Dollar Tree and picked up Italian Dressing and pepperoni for the salad plus enough for 2 more salads and a few other items that we needed. ~We used a coupon at Arby's for a family meal deal and both ate for under $10. ~Jeff picked up some sale priced lettuce for me on the way home from work. ~Jeff and I watched Steven on Saturday afternoon and had a wonderful time with him. ~We took Caesar for a walk on Tuesday to help perk him up since he was really missing Doofy (and so was I). We walked down to Jaysn and Rachel's and then Rachel and Steven walked back up with us and stayed to visit for awhile. ~I watched more shows online. ~I was able to hang some laundry out to dry on the line. ~Jeff and I cut my hair. ~Jeff subbed on Tuesday night for bowling league so he only had to pay $3 to bowl that night. ~I put in requests for several things from the library. ~I saved the rubber bands from the bunches of asparagus. ~While going through the freezer, I found a package with about 8 raviolis in it. I cooked those up and had them with some asparagus for dinner since it was just me at home that night. ~Jeff took me into town on Wednesday since I needed to get out of the house. We found a beautiful rosebush on clearance that we bought as a memorial to Doofy. It is going to be planted right at the top of the walkway leading up to our home to greet everyone. This helps me to cope with his untimely death to have something beautiful growing in his honor. ~Jeff found a gun nailer that came out to $19.99 after our coupon for donations at Goodwill. He has been wanting one for a very long time since it is getting harder for him to use a hammer. This is something that he and our sons will get a lot of use out of. These retail for starting at $300 and go up from there. ~We took advantage of a special dinner deal at Sonic. ~Jeff had a quick side job that paid $20. ~Thursday was a beautiful and sunny day with a high of 70F. I took advantage of it and washed the living room and dining room curtains and hung them out to dry on the laundry line. Jeff rehung the up for me once they were dry. ~Dinner was a BBQ ed meatloaf and a Ranch potato salad. I used up things here in the fridge, freezer and pantry, along with green onions from the garden to make it. So good! ~Rachel brought Steven up to play for a bit and he had a wonderful time running around the backyard and covered porch while we visited. ~I'm currently reading a book from the library. ~By careful budgeting, we were able to pay off the first half of our property taxes. Our taxes this year nearly doubled! I just wanted to thank you all for your support, love and comments on my last blog about losing our Doofy cat. I wanted to reply to everyone individually, but I thought this might be better. You all have touched my heart so very deeply and thank you for understanding that Doofy was not "just a cat", but a very valued member of our family and was like one of our kids. It has been rough not having him here but I was finally brave enough to go see his grave today. Not going to lie, it hurt and I had to fight the urge to cry again. I did not fall asleep until around 6 this morning after my husband got home from work and they I was up by 10:30 a.m.. I miss having him cuddle up next to me to sleep. Yesterday Jeff took me into town to get me out of the house for a bit and we found a beautiful rose bush. We are going to plant it at the top of our front stair walkway in the front yard so that it greets you every time you walk up the stairs. It is my memorial to Doofy. It will help me to smile and remember the good times with him, just as the other flowers in our yard that were given to us by loved ones who have now passed away do. Caesar is still looking for Doofy but I have noticed that Midgey is kind of stepping in and becoming Caesar's buddy, sticking close to him like Doofy did. I think Midgey knows that Caesar is sad and needs a friend right now. Patches is spending more and more time with me and following me everywhere. She wants to be near me at all times during the day and then had Midgey take over the night shift. Patches spends about half the day in my lap and Midgey spends the night on the bed with me. Be blessed all and thank you again! We sadly lost our Doofy (Rufus) earlier this evening. He had been his normal crazy self all day, running all over the place and playing and chewing on things. Just a routine day for him. I had just settled into my recliner when I heard him knock the candle on the pellet stove where he was sleeping. He got up oddly, went into what looked like a seizure and toppled off the pellet stove. I yelled and Jeff came running. We tried to make him comfortable as he looked again like he stiffened up and I gently pet him and talked to him softly hoping that he would come out of it. He was struggling and we could see it. Suddenly he stopped...everything stopped...his breathing, his heart and he was gone. I tried to massage his heart, I checked again and again for a heartbeat and breath, but none came. I held him and prayed...I was in shock. We knew he had some heart issues and we think he may have had a heart attack. He passed quickly with both Jeff and I beside him. It rocked me to the core and I just held my furry little buddy and sobbed. I did not want to let him go...he had so much energy in that long and lanky body. He used our home as his own personal racetrack and had fabric tunnels, boxes and toys to play with. He was forever getting into or onto something that he was not supposed to. He was a little escape artist. He was the goofiest and most entertaining cat we have ever had. He was also my cuddle buddy and slept with me almost every night. He would climb up my lap and onto my chest when I was in the recliner and look at me with his big soft eyes to get lovies every day. I am totally at a loss without him. Patches kitty saw us trying to save Doofy and came to cuddle with me when Jeff gently took him from him. She knew that her brother was gone and could see me in such deep pain. Later Midgey came out and cuddled with me. Caesar came in from the yard and immediately starting looking for his partner in crime and was very confused at not being able to find him anywhere in the house. I have never seen a dog and cat with such a tight bond. It is going to be an adjustment for him too. Jeff buried Doofy next to the rest of our feline fur babies that have passed on within the last 25 years. I am grateful that we were home and were able to be with him when this suddenly happened and also for my husband, who had the hard task of burying the cat who changed our lives in so many wonderful ways. Jeff had to go to work within about 2 hours of all this and I know it was hard on him. His main concern was for me and how devastated I was and still am. Our kids were wonderful though and so supportive when we told them. One of them even offered to come up and be here with me. We are blessed with such a wonderful family. Grief comes in waves and I am riding those waves tonight and will be for awhile. I have trouble sleeping as it is and Doofy helped calm me so that I was able to finally get some sleep in the early hours of the morning. He brought me comfort as he cuddled in and made his little contented noises when he found just the right position to sleep in. I felt safe with him there. He was also my alarm clock in the morning and we had a little routine when he wanted me up. He was obnoxious about it, but it became a game that we both knew would end with me getting up to let him and Caesar out. I will miss that too. So Doofy, thank you for saving me when I was spiraling downward into depression and bringing so much joy into our lives. Thank you for your antics, goofiness, playfulness and for bringing laughter and fun to me each day. Even on my worst flare days, you made me smile and brought moments of joy. You will always have a special place in my heart my Doofy Doo and I will forever love you. I'm going to attempt to get back to doing my Frugal Friday Wrap Up posts again...I know...it has been a long time. I was NOT good about documenting things this week so I am going to do my best to remember some of the high lights of it. Wish me luck! ~We finally have good vision insurance so I was able to go in, have an exam and order some progressive bifocal glasses. I got them for a third of the price that I would have had to pay without insurance. I also checked some of the discounted online places and I came out about even after my insurance at a local place. They did the whole in depth eye exam and I learned some new things about my eyes too. Yes, they are healthy but my corneas are not fully round. ~I bought a fully cooked chicken at Winco's deli for $4.98 after my eye exam and we had that for dinner with some mashed potatoes that I quickly made in the Instant Pot. Jeff offered to take me out to dinner but I declined and told him I would rather save the money. ~I then took the leftover chicken and made the following with it: chicken, rice (with leftover rice), broccoli and cheese casserole, curried chicken salad with grapes and craisins, and lastly a pot of chicken noodle soup. ~I cooked up 3 more artichokes that I got on sale for .99 each. I had one hot that night and the other two cold within the next few days. Artichokes are comfort food for me. ~We stopped by the Dollar Tree and I picked up more garden seeds since they are on sale 4/$1. We also picked up some strawberry jam that Jeff likes along with a few other items. ~I borrowed several books and movies from the library. ~My mother sent home an extra C-pap machine for Jeff that we just need to get the hoses and mask for. Jeff's machine is acting up big time and we can't afford to replace it. 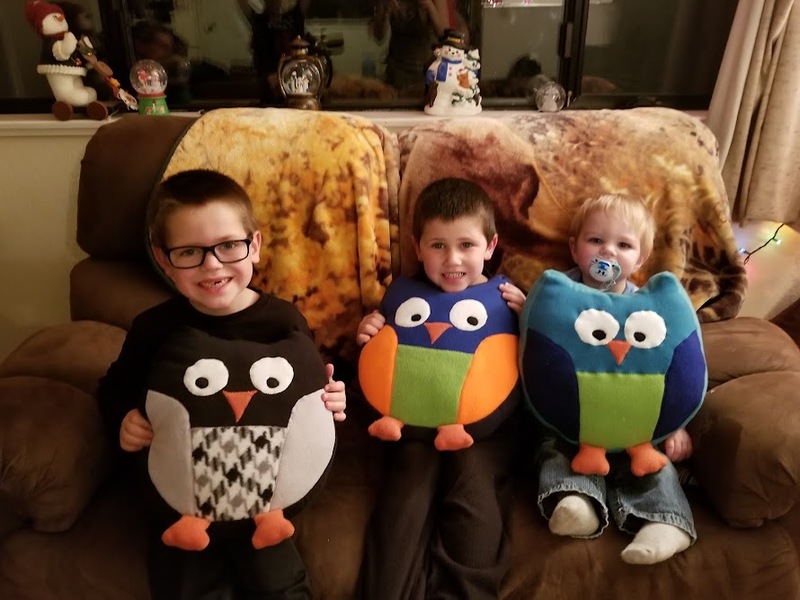 Our Chris, Heather and the little boys went over for a visit and they brought it back with them. ~Mom also sent home a lap quilt and wall hanging for me that she made. ~I've been watching TV shows online. ~Jeff and I sorted through more things to donate and some to sell. ~I took an old body pillow and wrapped it in a fitted full size sheet. I am using this on my rocker glider porch swing and both the cats and myself are enjoying the softness of it. ~I was able to hang some things on the laundry line to dry between rain storms. ~Jeff and I are trying to eat healthier so I have been cutting up veggies and putting them in containers in the refrigerator for us to use as a side dish with meals or to snack on. ~My Berkey water filter has been used a lot lately and we love it! ~Jeff found an extra coffee maker that I bought years ago and had gotten shoved way back in the pantry where we could not see it. ~I sterilized my eyeshadow pallets by spraying the eyeshadows with a mixture of water and alcohol. It kills any bacteria that might be growing on them and helps keep your eyes healthier. I went ahead and washed my makeup brushes while I was at it also. ~I went through our health and beauty products and took inventory of them so I know what I need and what I don't. ~Jeff has been picking up sale priced items for me that we need on his way to bowling or back home from work. Gas prices are going up so we are really trying to limit extra trips as much as possible. ~I found a code for an extra 60 minutes of phone time for Jeff's tracfone when I refilled his account. ~Shopko is going out of business so we bought 2 bras that are well fitting and super soft for me, some batteries and some canning supplies. All items were 50% off or more! ~My garden in coming back after it's winter nap and I see that my green onions, thyme, sage and kale all survived. My strawberry plants are growing quickly and so is the rhubarb. I've also been enjoying the flowers that are starting to bloom. ~Jeff is redoing the edging on our stairway that holds back the gardens. They were cement pavers that were sticking up making sharp tips. He tore all that out and is laying them all sideways so if someone falls, they will not be hurt as badly. We will use some of extra cement pavers that are leftover from this project around back and make a walkway that is less mudding out into the backyard garden. ~I had some cookie dough in the freezer so I got that out and baked us some cookies. That is about all I can think of at the moment. I'm hoping to get back to more baking of breads and things this week if the weather cooperates. We have been having lots of rain which causes my Fibro to flare. We also had historical flooding Monday in Moscow, Pullman and some other towns. Jeff and I got out of Moscow after my eye appointment right when it got the worst and they were shutting down roads because they had turned into rivers! It was scary and many businesses and homes were damaged. One of our hanai daughter's car was lifted out of a parking lot and dumped sideways over a railing, wedging it in sideways between the building and the railing. Her car is a total loss. 😢 We live up on a hill here in town so we are safe. Praying that we don't have more flooding because people are trying to clean up from the last round. The link that I am sharing is an affiliate link to amazon...I will get a small portion of the proceeds of the sale. Thank you! 1. I love it is that I can saute things right in the pot and that saves on time and dirty dishes. I am all about that! Yes, my hubby does the dishes, but this makes him really happy too. 2. I can put frozen food directly into it and set it to cook. It defrosts and cooks things so quickly. I can have frozen chicken breasts cooked and ready to go within about 30 minutes and that includes the time it takes the Instant Pot to come up to pressure. It is also great for all those make ahead freezer meals. You don't even have to thaw them first. 3. It makes cooking veggies a snap. Very little time is needed and it locks in all the nutrition. Potatoes for mashed potatoes take 4 minutes to cook and you can do all the mashing and mixing of the other ingredients right in the pot. Artichokes only take 14 minutes to cook and this time of year I buy a bunch when they are on sale and cook them all up. I have some hot right away and some cold later. 4. Soups are super quick to do and so good. 5. I recently made corned beef, cabbage and potatoes. It took 70 minutes to fully cook the corned beef to amazing tenderness and then I took that out to cool so I could cut it. I added some large chunks of red potatoes and a whole cabbage that was quartered to the cooking liquid in the pot and then set that for 4 minutes. It was delicious! Corned beef and cabbage usually takes me all day to cook in the crockpot and then I have to watch it for just the right time to add the potatoes and cabbage. 6. 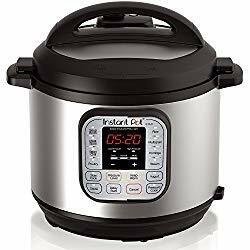 Your Instant Pot is also a slow cooker, rice cooker, streamer, etc. so you can get rid of some of your other appliances and save room in your cabinets or on your counters. 7. You can make all kinds of desserts in it too! 8. Casserole type dishes can also be made in the Instant Pot. 9. I keep an Pinterest board of Instant Pot recipes to try and use and have also found that there is lots of information on how to convert crockpot recipes. 10. It is a huge money saver! Even with my limited energy, I can throw together a meal very quickly. I can see this being a huge help for busy families, new moms, people like me with health issues and well, just about everyone! 11. I have found that it tenderizes meat really well and for days when I have trouble cutting my meat at dinner, this really helps. It also allows you to use some of those not so tender cuts (that are cheaper) and have them be as tender as some of the more expensive cuts. * Bonus is that they have also come way down in price now. They are now about half of what I originally paid for mine 2 Christmases ago. Honestly, I am finding that I am using my Instant Pot more and more lately. It really has saved me time, energy and tons of money. We are eating healthier and I am not having Jeff run down to the local tavern to pick us up dinner as much on those days when I just don't have the energy to do cooking the "traditional" way. My next goal is to teach Jeff how to use it so that he gets comfortable with it and I won't even have to get up to set it on those really bad flare days. No, I did not fall off the face of the earth, even if it might seem that way. 😉 I have been spending more and more time off the computer and outside enjoying the nicer weather. As I am typing this, I am glad I did because we are looking at rain for the next 7 or more days starting later tonight. Today however, I got out with Caesar for a much needed walk, pulled all the old sunflower stalks out of the garden, played with my youngest grandson and enjoyed some time out on the back porch reading. Yes, I may be paying for doing all that but it just felt good to be out in this glorious Spring weather after a long stretch of cold and snow. I have been spending much of the past month with my kids and grandkids that live close to us and going through jewelry for my cousin's store. Oh how I love them all! I have also been doing a lot of reading and tackling some small projects around the house. My sleep patterns are so "off" that I may find myself cleaning out a cabinet at 10:30 at night, but hey, at least I am getting something done. Of course when I do feel like I have a bit of extra energy, I push myself too hard and end up in a flare. Let's just say I have had many occasions where I have ended up in bed in the afternoon straight through onto bedtime and have also been taking more naps lately. It's like I hit a wall and just collapse. Last month Jeff and I celebrated our 34 wedding anniversary with a nice lunch out compliments of our son Josh. We tried out a new to us Greek restaurant and will definitely being going back there again. Our oldest grandson Bradley turned 7 and has a very fun Spy and Secret Agent themed birthday party. His mother made him the most amazing cake! There has been lots of cuddle time with the grandkids, and Isaiah even made me some new earrings. He loves to paint and create with his mother and I am the lucky recipient of some of his beautiful creations! Taking a month off from blogging has been a good thing for me. I've spent my evening reading, watching some fun shows and learning new skills. I've been trying out new recipes, planning out my garden, and working on trying to find more balance in my life. Jeff and I have worked on purging the big walk in closet, we've gone through clothes and have some to donate and some to take to the consignment store. We also have lots of other items to donate and some things that will go to my cousin's resale store. I made an appointment to have an eye exam and get new glasses this coming Saturday, something that I am way overdue on. Luckily we do have vision coverage through our health insurance and we are using some of our income tax return money to help cover the rest of the cost. It will be so nice to have glasses without scratched up lenses again. 😎 I still have other appointments I need to make to get caught up on all those lovely yearly health things that come up. Jeff and I are planning a weekend getaway at the end of this month and we are both very much looking forward to that. It will only be for 2 nights, but it will be nice to just be able to relax and spend time some time near the water again. We both need some "alone time" together without the daily distractions of projects and fur babies. Wife, mother to my own children and to many hanai children as well, and now also a very blessed Grammie to Bradley, Isaiah and Steven. Life is good! I ask that you not publish any pictures or content of this blog without written permission from me. Ethereal theme. Powered by Blogger.